Who will not feel romantic over Cinderella and "If the shoe fits" movies about shoes and prince charming? 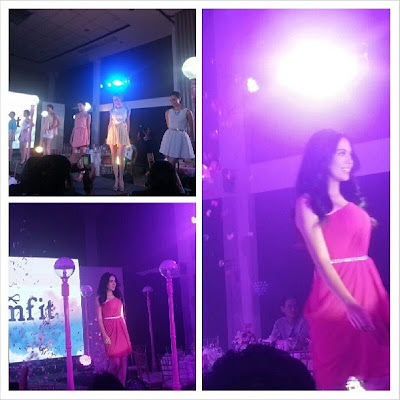 Comfit, the most popular shoe brand that seemed multinational because of its durability and world-class designs celebrated its 2nd anniversary launching their first celebrity endorser, Julia Montes last Thursday at 55 Events Place Quezon City. Listening to the romantic history of how the brand was created by the Lao family when he fell in love with shoes looking for the perfect fit for his wife, Comfit's designs got everyone romantic that night from beginning to end. Julia was actually surprised thinking she would only get sponsorship from Comfit. When I had the chance to ask questions, she mentioned that the shoes and sandals were so comfortable that any of her friend should try fitting the shoe to be convinced. I spend thousands to buy the perfect sandals for my feet that's too picky because of my metal implant in my left ankle and I have to be convinced. A few days later, when I visited their maiden store in SM North The Block, I bought my own pair and voila, it was so comfortable I changed my last sandals to Comfit's new pair of stylish and chic flower design. It actually costs cheaper than the one I bought from Payless. Comfit delivers the product durable enough to brave the rains and the slippery surfaces. I was very happy with my new sandals and they come in recyclable stylish bag that I can still use for school. Comfit, managed by Leapglass Corporation is also the Philippine distributor of the famous US footwear brand, Michael Antonio endorsed by Karylle. Since it's first store in 2011 at The Block SM City North EDSA, Comfit grew 12 more sale locations including Cebu franchised store. Visit the following branches nearest you: 1. 3F, The Block SM City North EDSA, 2. GF New Wing Market Market, 3. GF Alabang Mall, Alabang Town Center, 4. Lower GF, SM Southmall, 5. 2F J Centre Mall, Mandaue City Cebu, 6. Robinsons Dept. Store, Robinsons Magnolia, 7. Robinsons Dept. Store, Robinsons Manila, 8. 3F Trinomal Mall, 9. 2F Powerplant Mall, 10. 3F Newport Mall, 11. 5F East Wing, Shangri-la Plaza Mall, 12. GF Harbor Point Mall, Subic Bay and soon to open Robinsons Dept. Store Galleria and Robinsons Dept. Store Centrio Mall in Cagayan De Oro City. 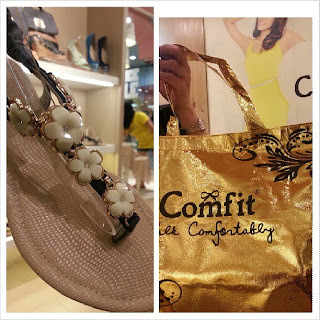 Visit https://www.facebook.com/comfitshoe for more details.